Weed control starts with the right timing to be effective. 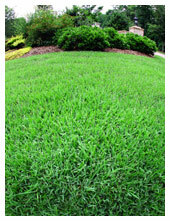 Don't miss an important pre-emergent application, call us today to insure that your lawn is protected. On the Outer Banks summer annual weeds can be a real problem for all turf grass sites. Weeds, in general, like to invade sites where turf grass is weakened, stressed and where the overall density of the turf has been reduced. Here at Atlantic Lawn our programs for maintaining a healthy dense turf as the best approach for weed management. Proper lawn care consisting of mowing at the correct height as well as trimming around shrubs is vital for the healthy manicured lawn. If you do have problems with these summer annual weeds, there are a number of products (pre-emergent herbicides) that can be used to control these pests. My experience with annuals like crabgrass, goose grass, sandbur, and prostrate spurge is they tend to germinate in the late winter/early spring season. Without a pre emergent and post emergent spray they will survive into summer and then mature. These are plants that come back each year by seed. Control of these weeds can be accomplished, but one has to apply the correct pre-emergent herbicide at the proper time. Here on the OBX, applications may need to be made in late February/early March. In the northern sections of the Outer Banks like Corolla and Duck, pre-emergence applications may be made in late February. Over the years I've learned, timing of the applications will depend on where your home is located and past weed problems. Remember, we are controlling germinating seeds-- so the pre-emergent needs to be put out prior to germination. Most lawn weeds are classified as grasses, broad leaves, or sedges. They can be annuals, biennials, or perennials. They can be warm or cool season plants. Are you confused, yet? Well, it can get confusing but there are many resources we can use . Our lawn care programs are custom designed for Outer Banks turf. Call our office for a free consultation and estimate today 252 441-7000.